Find the apartment home you’ve pictured at The Grove at Stone Park. Your stylish and comfortable living space features a full size modern kitchen complete with black energy efficient appliances, a polished stainless-steel sink, granite countertops, pantry, custom walnut cabinets, and a gorgeous tile backsplash. Expansive floor plans provide incredible interior storage, as well as lofty vaulted ceilings and magnificent lakefront views. Style and comfort are yours at The Grove at Stone Park. 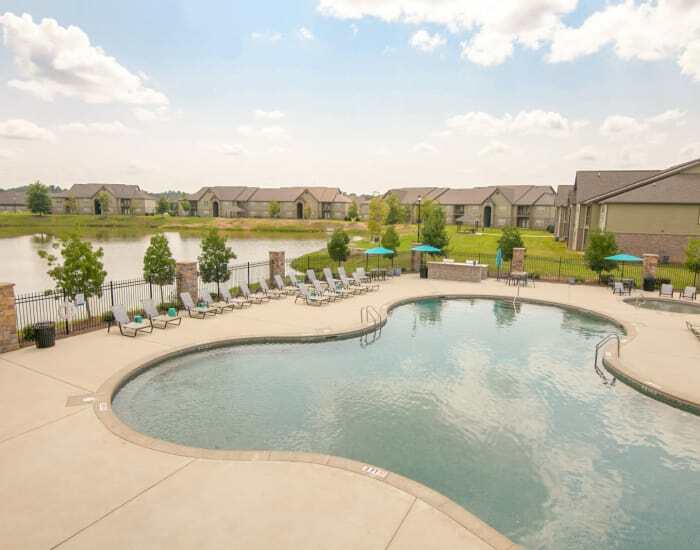 Relax and refresh with community amenities at The Grove at Stone Park. Take a refreshing dip in the resort-style saltwater pool and lounge on the sundeck as the kids splash in their own kiddie pool or make friends on the playground. Head to the fitness center for a sauna or a workout, or leash up the pup and go for a walk. Our attentive management team is here to make sure it all looks fabulous and works perfectly. Browse our one, two, and three bedroom floor plans to find the luxury apartment home that speaks to you, then schedule a personal tour of The Grove at Stone Park. We look forward to introducing you to exceptional pet-friendly apartment living in Pike Road near Montgomery, AL.